Mahan Air flight 1095 returned to land at Tehran-Mehrabad Airport, Iran after suffered an uncontained engine failure. The aircraft, a Boeing 747-300, registered EP-MNE operated a scheduled flight from Mehrabad International Airport to Bandar Abbas Airport, carrying 19 flight crew and 422 passengers. The aircraft departed from Tehran at 07:16 hours local time. About 07:18, while climbing through 7500 feet, the no.3 General Electric CF6-50E2 engine suffered an uncontained failure. Some parts of the engine detached and struck engine no. 4, as well as aircraft structure. The aircraft hydraulic systems no 1, 3 and 4 failed due to impact of debris from engine no.3. An emergency landing was made back at Tehran at 07:53. The operator’s fault to modify the ENG# 3 with AD requirement, and ineffective action for N1 Vibration which caused uncontained engine failure. 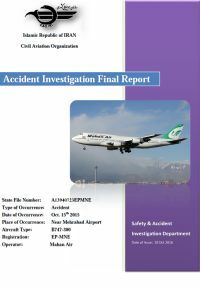 - Lack of effective monitoring in Mahan air concerning operation, training and technical divisions. The ICAO Air Navigation Commission (ANC) should recommend the Airworthiness Panel (AIRP) to review the situation of embargoed countries in respect of continuing airworthiness for receiving mandatory information from the State of Design and take corrective actions for implementing the standards of Annex 8, Chapter 4, by the Contracting States. To implement ICAO SARPS as well as its national CAOIRI regulations, to ensure the establishment of an effective engineering system in the air carriers to maintain aircraft airworthiness in a standard based level. To establish a system to monitor matching between operating aircraft category and airport characteristics . Require all aircraft operators to train pilots for the similar occurrences in the simulator for taking proper actions during the different course of the accident. To establish an analytical report for safety concerns about the effects of Embargo on civil aviation activities and deliver to the government of the United States to exempt Annex 8 standards related civil aircraft equipment from the embargo list for the improvement of the safety of civil flights. To review the findings of this accident report and improve the context of the AD No. 2012-02-07 to prevent such diffeciencies between the engine operators.